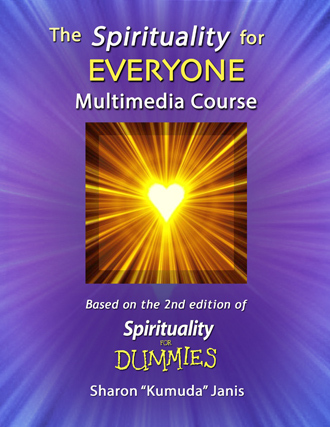 "Spirituality for Dummies" has been transformed into the "Spirituality for EVERYONE Multimedia Course," available free worldwide to schools, military, caregivers, parents, life coaches, friends, churches, and – EVERYONE! CARDIFF BY THE SEA, Calif. - Dec. 18, 2018 - PRLog -- For nearly two decades, Sharon Janis's critically acclaimed book, Spirituality for Dummies, has blessed and benefitted readers around the world who were brave enough to pick up the self-effacing title's two editions, in English, French, German, and Dutch. Some "spiritual folks" bemoaned the title's negative associations with the word "dummy," forgetting that one of the tenets of spirituality is the power of beginner mind and humble receptivity to spirit, as well as the importance of a good sense of humor. Some readers covered the cover with wrapping paper and feared being seen purchasing it in their college town's bookstore. But now is a new time, and our world needs the best we have to offer. Behind the gentle disappointment of seeing my offering go out of print last year, came a joyful blessing of receiving the rights back so I could offer this entertaining and enlightening compendium with a friendlier title and an adjunct multimedia course that currently offers 300 topics, from "where will you go next," to "Finding the Deeper Calling of your Soul," increasing your natural virtues, seeing the world with new eyes, remembering the cosmic joke, practices for body, mind, and spirit, and much more. The topics come with tangible explanations, stories, modern examples, and exercises, sprinkled with hundreds of quotes from sages and thinkers of a vast array of traditions, more than six-hundred cartoons that are twice as humorous when placed under the right topics, and links to related music, lectures, videos, audio readings and other multimedia content that helps elucidate and deepen the exploration of each topic. When this book says "EVERYONE," it includes being as accessible as possible to people from all walks of life around the world, and every economic situation. Classrooms and individuals can access the course immediately, without any registration, as long as they have access to a computer, tablet, or wireless phone. The "Spirituality for EVERYONE" e-book and full Multimedia Course are available free to everyone and anyone – individuals, schools, military, caregivers, parents, life coaches, friends, churches, and – EVERYONE, with a focus on personal philosophy and "friend on the path" guidance for each individual's journey to greater wisdom and self-respect. Why give the e-book and course for free? Because today's world needs the best we can offer. You don't have to give your email address, nor will you be bothered in any way. Guests can go to www.spiritualityforeveryone.com and click a link to download the Spirituality for EVERYONE e-book, with TOC links to each section of the Multimedia Course, and other spiritual graphics, lectures, music, and videos that can help friends around the world find greater joy, peace, and self-respect, and help alleviate today's widespread angst and personal anxiety with an enlightened perspective of the divine presence smiling behind it all. The paperback book is also available for purchase on Amazon and other booksellers, if that format is preferred.